[Judas Maccabeus] took up a collection . . . to provide for a sin offering. In doing this he acted very well and honorably, taking account of the resurrection. For if he were not expecting that those who had fallen would rise again, it would have been superfluous and foolish to pray for the dead. When loved ones die, many people experience, in addition to grief and loneliness, a concern over the state of those loved ones, particularly if those departed souls weren’t the saintliest people in their lifetime or if they died sudden, unprovided deaths. What has become of these souls? Those who are left behind wonder. The Church has always taught the existence of Purgatory, a place or state of existence after death, where, if necessary, we’re cleansed of any remaining effects of our sins and made ready to enter into Heaven. Moreover, as Scripture attests, our prayers and sacrifices can be of immense spiritual help to the persons undergoing this purification process; we can pray for specific persons, such as deceased loved ones, or for the souls in Purgatory in general. Because God loves us and wants us to be with Him in Heaven, there must be some opportunity for us to finish being healed, or purged of our sins, after death, should this be necessary. This cleansing process is what we call Purgatory. The saints believed without reservation in this reality. They themselves, because of their immense love of God, were ready to enter Heaven immediately after death, but they were mindful of those who werenot as fortunate; after all, this is one of the signs of true love: caring for those in need, whether that need be physical or spiritual. St. Elizabeth of Portugal, who reigned as queen of that country at the beginning of the fourteenth century, had a much-loved daughter named Constance. The young princess died very suddenly after being married, causing Elizabeth and her husband, King Denis, much grief. Soon after this, a hermit came to the queen with a shocking story: while he was praying, Constance had appeared to him, beseeching him to take a message to her mother. She was suffering terribly in Purgatory and would remain there a very long time unless Mass was offered for her each day for a year. This article is adapted from a chapter in Saintly Solutions to Life’s Common Problems. The king responded, “I believe that it is wise to do that which has been pointed out to you in so extraordinary a manner. After all, to have Masses celebrated for our dear deceased relatives is nothing more than a paternal and Christian duty.” Elizabeth accepted this advice, and arranged for the Masses to be said by a holy priest. One year later her daughter appeared to her, clothed in a brilliant white robe, and said, “Today, dear mother, I am delivered from the pains of Purgatory and am about to enter Heaven.” St. Elizabeth gave thanks to God and expressed her gratitude by distributing alms to the poor. A number of saints (plus other mystics and visionaries) have allegedly seen Purgatory (and also Heaven and Hell). St. Frances of Rome was granted such a vision; she said that it consists of three levels. The lowest level is like a vast burning sea, where the persons undergo various sufferings related to the sins they committed on earth. The middle level is less rigorous, but still unpleasant. The highest level of Purgatory is populated by those who are closest to being released. These persons suffer mainly the pain of loss: that of yearning for God and of not yet truly possessing Him. There’s consolation in all three levels, but especially in the highest. The souls in Purgatory know that, sooner or later, they’ll be with God in Heaven and that all their present sufferings are valuable and redemptive. Other saints and visionaries confirm this description, adding that our prayers and sacrifices — because they’re freely given — are immensely helpful to those in Purgatory, for God greatly values each one of our freely offered sacrifices, no matter how small. Some mystics have supposedly learned that when we pray for specific persons who are in Purgatory, they see us at that instant and are strengthened by the knowledge that we’re remembering them. Many of the saints are said to have had experiences that confirmed the Church’s teaching on Purgatory. For instance, St. Louis Bertrand, a seventeenth-century priest, offered Masses, prayers, and sacrifices for his deceased father until finally he was granted a vision of his entry into Heaven. This happened only after eight years of prayer on his part. In the twelfth century, the famous Irish bishop St. Malachy learned that his sister was destined to suffer a long time in Purgatory, for she had lived a very sinful life before repenting; his prayers eased her sufferings., but did not significantly lessen her time there. In the fifteenth century, the sister of St. Vincent Ferrer appeared to him as she was about to enter Heaven and revealed that had it not been for the many Masses he offered on her behalf, her time in Purgatory would have been much longer. A story is told about St. Teresa of Avila in this regard. A priest she knew had just died, and God revealed to her that he would remain in Purgatory until a Mass was said for him in the chapel of a new Carmelite house that was to be built. Teresa hurried to the site and had the workmen begin raising the walls of the chapel immediately, but as this would still take too long, she obtained permission from the bishop for a temporary chapel to be erected. Once this was done, Mass was celebrated there, and while receiving communion, Teresa saw a vision of the priest thanking her most graciously before entering God’s kingdom. Showing concern for the dead and the dying is a great sign of love. Bl. Raymond of Capua, the biographer of St. Catherine of Siena, wrote that she attended her father, Jacomo, during his final hours. Learning in a revelation that this holy man nonetheless would require some purification in Purgatory, Catherine begged God to let her suffer pains of expiation on his behalf so that he might enter Heaven immediately. God agreed; Jacomo, who had been suffering greatly, thereupon experienced a happy and peaceful death, while Catherine was seized with violent pains that remained with her for the rest of her life. Raymond witnessed her suffering, but he also took note of her incredible forbearance and patience, along with her great joy on her father’s behalf. An incident from the life of the Italian priest Bl. Padre Pio indicates that souls in Purgatory may request our prayers. One day in the 1920s, he was praying in the choir loft when he heard a strange sound coming from the side altars of the chapel. Then there was a crash as a candelabra fell from the main altar. Padre Pio saw a figure he assumed to be a young friar. But the figure told him, “I am doing my Purgatory here. I was a student in this friary, so now I have to make amends for the errors I committed while I was here, for my lack of diligence in doing my duty in this church.” The figure said that he had been in Purgatory for sixty years, and after requesting Padre Pio’s prayers, he vanished. Many other souls in purgatory are said to have asked for his assistance, including four deceased friars sitting around the fireplace in a state of great suffering; Padre Pio spent the night in prayer, securing their release. Other saints are said to have had similar experiences, including St. Odilo, the eleventh-century abbot who began the practice of offering Mass for all the souls in Purgatory on what is now known as All Souls Day, the day after the feast of All Saints. Our prayers for those who suffer there can be spiritually valuable to them. Because the saints believed in both sin and redemption, mercy and justice, they also acknowledged the existence of Purgatory and did everything possible to relieve those undergoing purification there. As the saints were far more conversant with the ways of Divine Providence than any of us could honestly claim to be, we would do very well to follow their example. Editor’s note: This article is from a chapter in Fr. 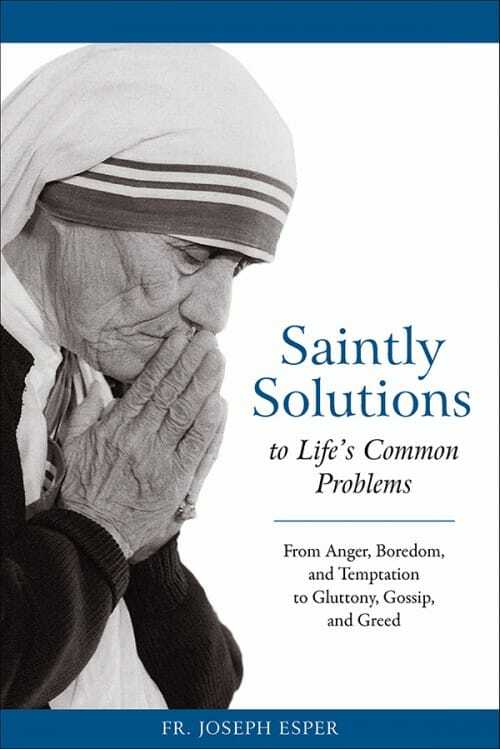 Esper’s Saintly Solutions to Life’s Common Problems, which is available from Sophia Institute Press. Fr. Joseph Esper studied at Sacred Heart Seminary in Detroit and at St. John’s Provincial Seminary in Plymouth, Michigan. He was ordained a priest of the Archdiocese of Detroit in 1982. He has lectured at Marian conferences, spoken on Catholic radio, and written more than a dozen articles for This Rock, The Priest, Homiletic, Pastoral Review, and other publications. From his experience as a parish priest, Fr. Esper offers today’s readers practical, encouraging, and inspiring wisdom.